In 1885 Diepenbrock’s Drie Ballades (Three Ballads) opus 1 were published in Amsterdam. The work consists of: Entsagung (Renunciation, RC 3, Uhland), Der Fischer (The Fisherman, RC 6, Goethe) and Der Abend kommt gezogen (The Evening Falls), his econd song on a text by Heine. Looking at Diepenbrock’s vocal works, one will easily notice his great affinity with poems dedicated to the evening and the night. He especially had a preference for German poems from the so-called ‘Sturm und Drang’ and early Romantic period. In 1884, in addition to Der Abend kommt gezogen, Diepenbrock shortly after each other composed Dämmerung (Twilight, RC 7) for choir a cappella on a poem by Goethe and the song Dämmernd liegt der Sommerabend (In Twilight the Summer Evening Lies, RC 8) on a text by Heinrich Heine. 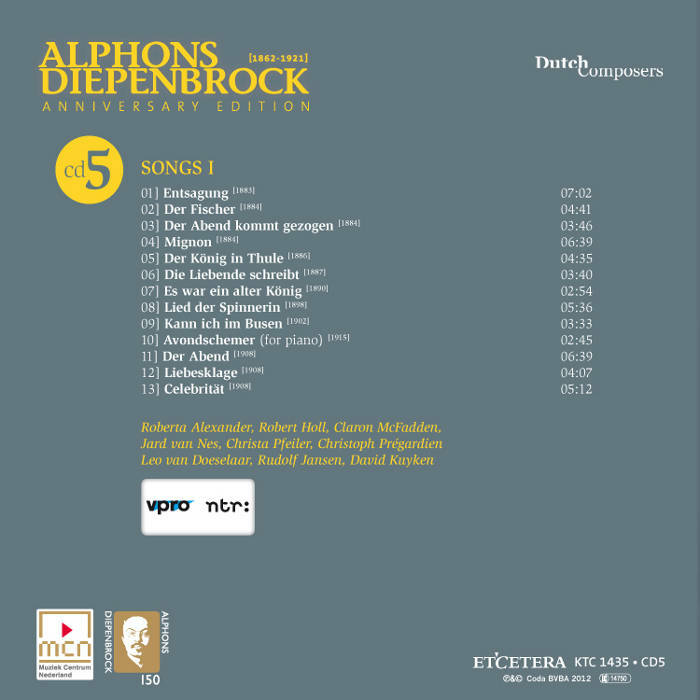 The majority of Diepenbrock’s symphonic songs from later years are also dominated by nocturnal moods. Like the poem Der Fischer, which Diepenbrock had set to music only a few months before, Der Abend kommt gezogen is an example of a ‘Wasserfrauen-Gedichte’ (mermaid poem). And just as Goethe’s poem, Heine’s ballad is about the seduction by a mysterious but irresistible mermaid, a ‘Wasserfee’. By repeating the line “Du schöne Wasserfee!” (You beautiful mermaid!) at the end of the third, fifth and seventh strophe, a climax is reached. Diepenbrock’s musical setting highlights this sentence by using an identical ending in the verses three and five, which is elaborated at the end of the seventh. This strophe culminates with the tenor reaching the a’ on the word “schöne”, which now, appearing for the third time, should be sung ff instead of pp. Der Abend kommt gezogen, the third of the Drie Ballades, is dedicated to the Amsterdam singer Frans Philippeau. The tenor was a member of the (amateur) vocal ensemble Diepenbrock conducted at the beginning of his career which was specialised in early Flemish and Dutch polyphonic works. 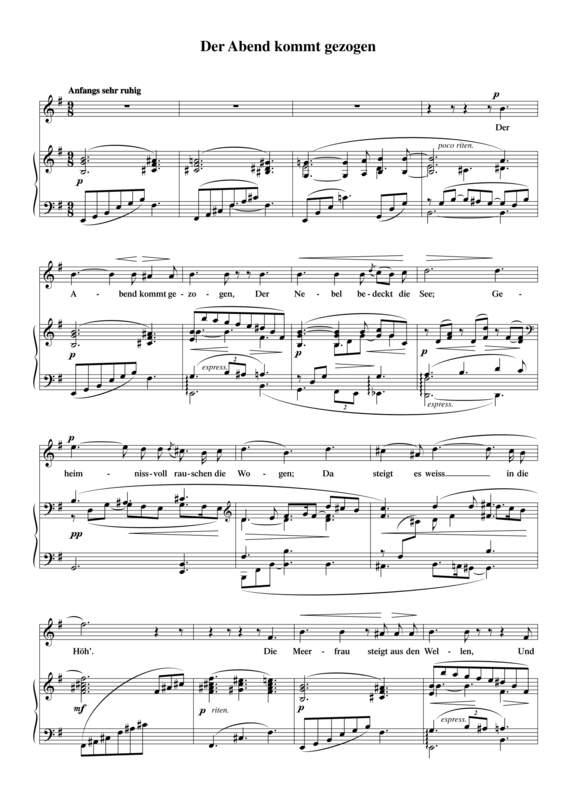 The composer ran through the song with Philippeau shortly after it was written in August 1884 (BD I:98), obviously with a performance in mind, although there is no documentation on this. Later Diepenbrock did play his opus 1 to the composer Charles Smulders. (BD V:20) However, Diepenbrock did not follow up the suggestion made by another friend, W.G. Hondius van den Broek, in 1907 to let the young tenor Rudolf van Schaik practice these songs (BD V:446-447). As far as we know the Drie Ballades have never been performed in public during Diepenbrock’s lifetime. Da steigt es weiß in die Höh’.